Gossip surprisingly has something in common with infectious germs. “They both get traded in the same place … in breakrooms,” says Charles Gerba, a professor in microbiology and environmental sciences at the University of Arizona, Tucson, Arizona. Experiments show that breakrooms in commercial buildings, offices, schools and hospitals are breeding grounds for infectious germs. As a result, janitorial staffs in these facilities should focus more attention than they typically do on disinfecting commonly touched surfaces such as coffee pot and refrigerator handles, countertops and tables in these areas, says Gerba. Custodial staffs should disinfect these areas at least once a week or even more frequently to stop the spread of disease, says Gerba. 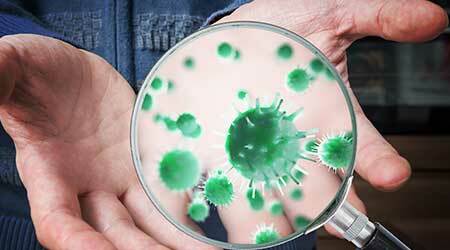 Infectious germs, known as pathogens, can cause a host of illnesses that can be both costly and deadly. Germs that cause the common cold and influenza, along with hepatitis and Methicillin-resistant Staphylococcus aureus (MRSA), can easily live on commonly touched objects and, as a result, can wreak havoc in facilities such as commercial facilities, K-12 schools and hospitals. 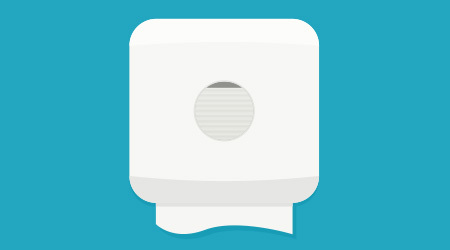 In addition to surfaces in breakrooms, other high touch objects in commercial, educational and healthcare facilities that need frequent disinfecting include public phones, hand rails and first-floor elevator buttons, which tend to be “disaster areas,” says Gerba, who recommends cleaning these objects at least once a day. Janitorial staffs should also focus on countertops in public restrooms in hospitals, schools and commercial buildings. According to Gerba, restroom users tend to turn on the water and rinse their hands before washing them, which results in germ-filled droplets ending up all over the counter, faucet and mirror. Custodians should disinfect these restroom surfaces as much as they clean the restrooms, he says. Tables, arms on chairs and doorknobs in conference rooms in offices are also covered with pathogens and should be cleaned each day that they are occupied, especially during cold and flu season, says Gerba. Countertops, handles and toilet seats aren’t the only issue — the floors in health care facilities aren’t as clean as they should be. Janitorial staffs are much more apt to keeping floors dry and clean of debris and soils rather than focusing on disinfecting the surfaces, but experiments and studies show floors can be contaminated and contribute to the spread of pathogens. When a patient emits pathogens in a hospital they can land on the floor. As people then walk on that floor or objects are moved, these pathogens can be brought with. While the floor isn’t going to be as high-risk a surface as something commonly touched by the hand, a greater understanding of its impact on the spread of infection might be needed. Touch pads and remote controls in hospitals, schools and hotels are also high on the list of “germiest” frequently touched objects. Remote controls are ignored because they tend to be difficult to clean and disinfect, says Gerba. In addition, hospital surfaces in patient rooms and nurses’ stations ideally should be disinfected multiple times a day, says Heidi Wilcox, of Wilcox EVS Solutions, an environmental services and sustainable infection control firm in Haverhill, Massachusetts. “We have to work within the confounds of the process that is set up and set up realistic protocols, but in my experience most processes and systems can increase efficacy with streamlining, adding technology and reorganizing how things are done,” she says. High touchpoints in schools such as stair railings, bathroom doors, locker handles, and water fountain buttons are touched multiple times a day and “wiping them down more than once a day can help mitigate the spread of any infectious diseases,” she says. Desktops in schools are also source of pathogen infestation and they’re often overlooked by custodial staffs, says Gerba. Locker rooms are another school area that often get ignored, says Hicks. School facility managers need to look no further than the National Football League to understand the ramifications of a MRSA outbreak in locker rooms and athletic facilities, he says, referring to several outbreaks that got several professional football players sick, including at least one who needed to retire due to an infection, over the last couple of decades. Hicks says that some of the reason why frequently touched objects in high-traffic facilities rarely get disinfected is the time and cost constraints that are placed on janitorial staffs. Janitorial staffs typically “clean the sinks and toilets and that’s it,” he says. Creating a culture where disinfecting these items becomes more prominent starts with education, he says. “If they know the whys of what they are doing, then when you show them how to do it, they’ll understand it better and why it is better not to cut corners,” he says. “Unfortunately, there is not one answer for all facilities. Each is unique and different but at least once a day is necessary and, in flu and cold season or an outbreak of some sort, the frequency should increase to mitigate the spread of the infectious outbreak,” she says.